Fanfarlo are an indie pop band which formed in 2006 in London, England. The band consists of Simon Balthazar (vocals, guitar, clarinet), Cathy Lucas (vocals, mandolin, violin, keyboards), Leon Beckenham (keyboards, trumpet), Justin Finch (bass, vocals) and Amos Memon (drums). Mark West (guitar, keyboards) left the band in 2008. 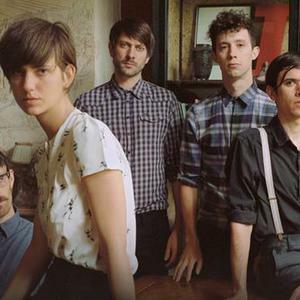 The band's name is a reference to Charles Baudelaire's novella, "La Fanfarlo." After issuing the singles Talking Backwards, You Are One Of The Few Outsiders Who Really Understands Us, Fire Escape and Harold T. Wilkins on four independent labels between 2006 and 2008, Fanfarlo travelled to Peter Katis's studio in Connecticut, USA to record their debut album, Reservoir. The album was self-released in February 2009 to coincide with a tour of England and Scotland, including dates supporting Snow Patrol. They also performed five shows at the South by Southwest festival in Austin, Texas in March. accessible as possible, Fanfarlo decided to offer their latest album, Reservoir, as a $1 download on http://fanfarlo.com until 7/4/09. In May, Moshi Moshi will release Fanfarlo's fifth single, Drowning Men, on 7" while Reservoir will again be self-released as a special 'box' edition of 500 CDs. Fanfarlo will be appearing at select festivals over the summer including the Hinterland Festival on April 30th in Glasgow with further dates to be announced.